The Limehouse area was once one of the doorways to the world of trade for the British Empire. The docks saw many ships from lands all across the world land here. It was once a great hub for important and exporting a plethora of goods. The Grapes overlooks the Thames is a peaceful area of London. It is one of the city’s oldest pubs with a rich history. The pub is owned by veteran actor, Sir Ian Mckellen. He is the star of such Hollywood movies as the X-men series, The Lord of the Rings, The Hobbit and Mr. Holmes. Fans of Mckellen should see this pub as a must visit destination when in London. 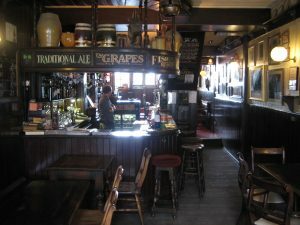 The pub has a long history including connections to Victorian author Charles Dickens. It is the setting for the opening chapter of his book Our Mutual Friend. The area has inspired many other artists and writers. Oscar Wilde set the Picture of Dorian Gray here. Arthur Conan Doyle uses it for a Sherlock Holmes story about Chinese immigrants. More recently it has been the setting for book and film the Limehouse Golem. The area where the pub resides is tranquil yet not too far from Canary Wharf. This makes it an ideal pub for those who want to get away from loud London life but still want to be able to commute easily. Since 1996 it has been recommended by the Good Pub Guide, a trusted critical publication. They have a festive menu for those who want to enjoy the pub during the holiday season. It has a cosy and enchanting atmosphere. They advertise the fact that their menu is ideal for those who want a quick bite to eat and a pint to go with it. This is convenient for those who want fast service.